Seems these day everybody has to diagnosed with something. It's almost like it's a requirement. A pill for everything and everything requires a pill, or maybe just extensive therapy. I could rant for a week about this. It really bothers me how dependent on medications we've become for things that could be dealt with by simply eating right, exercising and accepting the fact that life isn't perfect and it okay to cry. I'm sure there is a pill I could take so this wouldn't bother me anymore, but I'll go without, thank you. 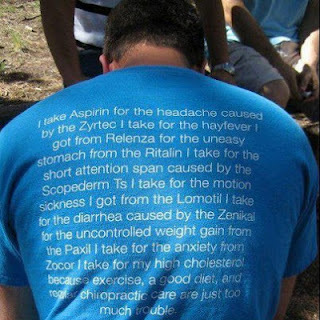 There is a use for medications, all medications. But we've seem to simply choose to take a pill and that's it. Especially with mental health issues. People think "I'm depressed, I'll take a pill and it will all be better." Well, no it won't. If you have high blood pressure, you don't just take medication for it and continue on without any changes to your lifestyle. Well, at least you shouldn't. We should change your diet and exercise more, addressing the CAUSE of your high blood pressure, not just treat the high blood pressure. I am willing to bet that with in 5 years, there will be medication available from my vet to treat my dog's OCD. I'm serious. Both on the mental health meds for pets and that my dog has OCD. If I move is bed two feet, he panics when he sees it has moved and has to adjust it until it's just right. He will not walk through the kitchen in one direction. My parent's have two sets of steps going down to their living room. My dog will only go down one set of steps and will only go up the other. It's weird, but that's my dog. He is a little different, like every dog is a little different, and has a distinct personality. Just like people. We are all a little different, we WANT to be a little different and stand out from the crowd, but freak out when we do stand out. I truly believe a lot of our health problems, both physical and mental, can be controlled or eliminated with regular exercise, a better diet, a little discipline and slowing the pace down a few notches. Turn off the cell phone for an evening and take the kids for a walk. Accept the fact that your not perfect and never will be. Quit comparing yourself to others, who are actually just as messed as you on the inside. Surround yourself with people who care and stop caring about what those who don't care think. No, you can't fix all problems by walking a little more and having a few less cheeseburger, but it will help. It's better than making excuses. "I know I should exercise more and live on a written budget, but I just don't have the time." So instead you stress out over money, your body goes south and your depressed over being broke, fat and you have high blood pressure. Not willing to make the time to live happier, healthier and longer? No problems, they got a pill for that. Like I've said before and most likely will say again, we're getting soft. After reading this post this morning, I was tempted to take it down and edit it. Perhaps making it into several posts instead of one. My rant went off in several tangents. As you can see I decided to leave it as is. A rant is a rant. Sometimes they jump the tracks and go onto other subjects.